All you need to do is take a stroll down Spring Garden Road in Halifax, and you'll find someone who's homeless. 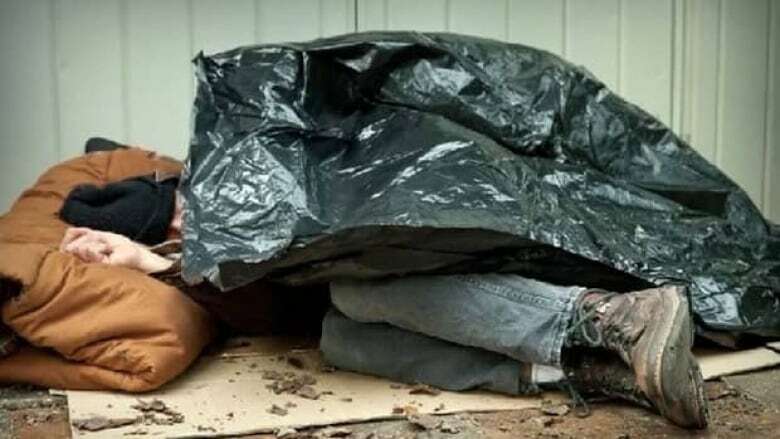 In fact, it's becoming easier to spot people who are living on the streets of Halifax because the numbers are rising. Many people who don't have a place to live can also be found hunkering down in corners and coffee shops in an effort to stay warm. The CBC's Angela MacIvor has spent the last few weeks speaking to people who are homeless, and the people who help them. Watch CBC News Nova Scotia for coverage throughout the week. The Nova Scotia Housing and Homelessness Network defines homelessness as people staying "in a shelter, with friends or family, in a public place, or other site not intended for human habitation for at least 10 of 90 days." The fastest growing pocket of the homeless population is youth ages 19 and younger. Chantelle D'Eon has been living on and off the streets since she was 16 years old. "Being a street kid, the streets are no place for a kid, and that was the problem exactly," said D'Eon. "I was and I still kind of am a kid, you know? That was not what I should have been doing with my time. Mind you, I've learned a lot." There are now seven shelters operating in Halifax. The organizing committee at Out of the Cold emergency shelter in Halifax monitors how many beds are used at each location on a nightly basis. According to their numbers so far this winter, all seven shelters have been full 90 per cent of the time. On nights when there are no beds available, Out of the Cold still allows people to drop in for a few hours. "We wanted to at least provide a sanctuary for people who don't have anything," said Jeff Karabanow, organizing volunteer at Out of the Cold. "We will open our doors to anybody who needs the space to warm up, get coffee, use the washroom, talk to a volunteer. We want to have a safe, out-of-the-cold environment for them." The Nova Scotia Housing and Homelessness Network surveyed 127 people of the total 1,973 who were staying in Halifax shelters last year. The survey showed the main reason why people end up homeless is the lack of safe and clean affordable housing in the city. "The rent is increasing and the income level is just not keeping up to par," explains Claudia Jahn, director of the Affordable Housing Association of Nova Scotia. According to Jahn, it's not financially possible for many people to leave the shelter system. "It would actually be much cheaper for all departments to provide people with the necessary services so that they will move out of the shelter system, into permanent housing," she said. Karabanow agrees more needs to be done. "We have been advocating for years around more supportive housing, more affordable housing, more safe housing for folks," said Karabanow. The NDP government is now developing an affordable housing strategy, which it hopes will address those issues.